Samurai Sudoku are a variant of Regular Sudoku puzzles, that feature conjoined grids, leading to a longer and more satisfying solving experience. 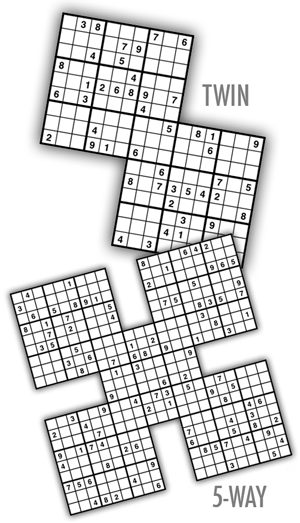 My Samurai Sudoku puzzles are available in 2 different layouts (Twin, and 5-way). Each volume contains 100 printable booklets. Within each volume, the books are ordered by ascending difficulty -- so Book 1 contains easier puzzles, and Book 100 contains extremely difficult puzzles. Each booklet contains eight puzzles and a page of answers. Note: I've been told that these puzzles are significantly more challenging than Samurai puzzles offered elsewhere. I happen to like this level of difficulty, but you may find them too difficult. You've been warned! 5-Way Five Sudoku grids are arranged like a butterfly and take a long time to solve.